Deer resistant plants? Is there really such a thing? The only way to have a deer-proof garden or landscape is to take a multi-faceted approach. We need to start with deer resistant plants, then we may need deer repellents to at least protect the new growth. In extreme circumstances we may also need deer fencing. First, if you aren't sure if it is deer causing your damage, check out out page describing deer damage, so you will be sure you going in the right direction. Deer Resistant Plants Are the First Place to Start with your new deer solution strategy. We have combined information from several sources to give you several charts of deer resistant plants to choose from. Follow the links to our charts of deer resistant plants. These charts list deer resistant plants by Latin and common names along with the states publishing the information and special comments per variety. 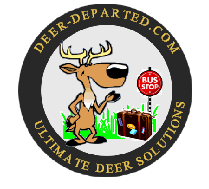 Do you need deer repellent, but don't want to buy a ready-to-use product? Make your own with these homemade deer repellent recipes. Interested in learning more about deer? Check out our blog and get a better understanding of deer. Have You Almost Hit A Deer On the Road? Wildlife traffic accidents cause millions of dollars of damage each year. Every year about a million deer are hit by cars. Check out our deer whistle information and a list of deer crash prevention precautions that you can be taking to prevent an accident with a deer. Read about electronic deer whistles and air whistles that you can mount on your car or motorcycle. Watch a great video of a deer jumping over a motorcyclist. What if you actually want to feed deer so they stay out of your garden? We have plans for several different kinds of free deer feeders Read our automatic deer feeder factsto learn more. We have free plans and pictures for pvc feeders, bucket-type feeders, trough types, and automatic deer feeders. Deer repellent products. Repellent products and resources..
Natural deer repellent protects your garden and landscape without putting your family at risk. Organic liquid repellents include 1 gallon Deer Away, deer chaser electronic control and deer-off. Deer resistant plant charts catagorized by deer preference, plant type, Latin and common names. and by individual state information. Over FIFTY different deer repellent recipes. Homemade deer repellent tips. Read and decide whether to make your own or buy. Do Deer Whistles Work ? Deer Whistles, also called deer alert whistles,are used by tens of thousands of believers. With over a million accidents with deer a year, shouldn't you know the facts? Mechanical deer deterrents such as electronic deer controls, deer derrents, deer fencing, and mechanical deer deterrents all have their place in multi-approach to deer control solutions. Deer fencing options need to be reviewed and compared whne repellents just aren't enough. Deer repellent tips so that you buy the right repellent and know the best way to use it as a deer deterrent. For a deer proof garden you need to read these tips and follow the advise of experts. Identifying ticks and links to deer tick photos, videos and important information to identify your ticks and remove them. Deer Damage How Can You Tell? Deer damage, how can you tell it is deer that are damaging your garden and landscape or some other creature? Some deer deterrents can be hard to classify. Deer ribbon is a type of deer deterrent that involves applying deer repellent to a special ribbon of material . Compiled list of deer resistant vegetables, herbs and fruit. There aren't many edible foods that people like and that deer don't. Deer resistant plants are the first line of defense against deer. White-tail deer density map showing populations is produced by the Quality Deer Management Association. Zoom in on your county and discover the deer density in your area. Commercial deer control for orchards, field nurseries, container nurseries, Christmas tree farms and other horticulture industries fight a constant battle. This deer predictor will help you decide when deer are most likely to be a problem so you can plan your deer repellent application. A homemade deer feeder can be made quickly and cheaply. Free plans for several different types of deer feeders. Chinese medicine has long known that velvet deer antler could be used to treat arthritis and other ailments. Read more about the healing power of deer velvet. Pictures of deer of all kinds. Whitetail deer pictures,albino deer,mule deer photos,deer pics and videos with cats,dogs,and other animals. Deer management frequently asked questions. Why do deer do what they do? Several deer research papers are brought together from the public domain for deer repellent information and comparisons. Repellex deer repellent reviews. Read before you buy. Deer repellents have different modes of action. Taste or contact deer repellent works best in colder seasons and keeps deer from taking a second bite from plants. Deer odor repellents work by either repelling by odor or taste. Know what works best for your situation. Deer repellents that combine repellents that work both as taste and odor repellents can be used year-around. Combining products can give the best of both worlds. Deer repellent research comparing various brands. Professional government research. Deer jerky recipes for those who use the final solution for deer control. Deer jerky can be easy to make yourself.